There are essentially two types of writers in the world: those who create and follow outlines with ease, and those who are paralyzed by them. I’m the type that gets paralyzed. Now, don’t get me wrong. I still find outlines very useful, but not until after I’ve written a full draft. Then and ONLY then can I find the right organizing scheme that develops organically from the content, rather than being imposed upon it. If I set up an outline too soon in the game, and then try to follow it, I will spend hours staring blankly at my screen, or writing in fits and starts, going here and there and essentially nowhere in the end. I am the kind of writer who needs the process of getting the words down on paper (or these days, coded into bytes), in order to find out what I know and what I want to say. Writing for me is a process of discovery. I write down one thought, and that thought suggests another, and another, and another. Ultimately it becomes clear that I am beginning to repeat myself, and that I am rambling, often incoherently. But it’s best for me to keep the words flowing until they just won’t flow anymore. Then I can go back and edit out the chaff and put like things together and contrasty things side-by-side, and separate the ideas that belong in some other work from the one I need to write at the moment. So how does that work after you have submitted a dissertation proposal with this beautiful outline that makes so much sense…until you actually try to write the material that is supposed to go with it? Well, as I told one of my coaching clients recently: the purpose of your outline in your dissertation proposal is to get your committee’s approval. After that, you are free to go wherever your ideas and your research take you, as long as you end up with something remotely resembling your proposal…and it is good. The truth of the matter with my own dissertation is that you would barely recognize what I ended up with compared with the original outline I proposed. That’s because in the process of doing the research I learned so much more than I knew when I started. How can you create a workable outline of a piece that you haven’t even researched yet? Another analogy I gave her derives from an essay I wrote decades ago when I applied to be a teaching master of arts candidate at Cal State Long Beach. I wrote then comparing writing to the process of working with clay in the ceramics courses I’d taken while I was an art major. One day I was working in the ceramics lab diligently trying to create nice little objects that would serve as Christmas gifts. The instructor came by and asked what I was doing. He said that was fine if that was all I wanted to do. But if I wanted to become a potter, I had to learn to listen to the clay. Instead of imposing pre-conceived ideas about what my object should look like, I had to learn to listen for the clay to tell me what it wanted to be. And I had to make mountains of mistakes, working the clay over and over and over again. Stopping, slicing it to see how even the walls were, then punching it down and starting over again. And over and over and over again. That’s the same way I approach my writing. That is, the writing that comes before the editing. My client gave me her plan for the next time — that she would do the next chapter, and she said it would be beautiful. I said, “I’m not looking for beautiful.” Beautiful is what happens after the clay is out there, after it’s been worked through, after it has told you what it needs to be. Then we carve, cutting out what doesn’t belong, shaping and reshaping what is left. Don’t worry about beautiful, I said. I am an expert at organizing and polishing writing, but I can’t do it until after the writing has been done! Editors are wonderful beings — whether in your own head, or hired. They are extremely useful and, when activated at the proper time, they can do beautiful. But the ones in your head have a tendency to block you rather than help you if employed to early in the game. So for now, just write! This entry was posted in Organizing the dissertation, Psychology of Writing, Surviving Academia, Writing the Dissertation and tagged academic editing, coping with criticism, dissertation, organizing the dissertation, surviving academia, writing on March 22, 2013 by matrixedit. 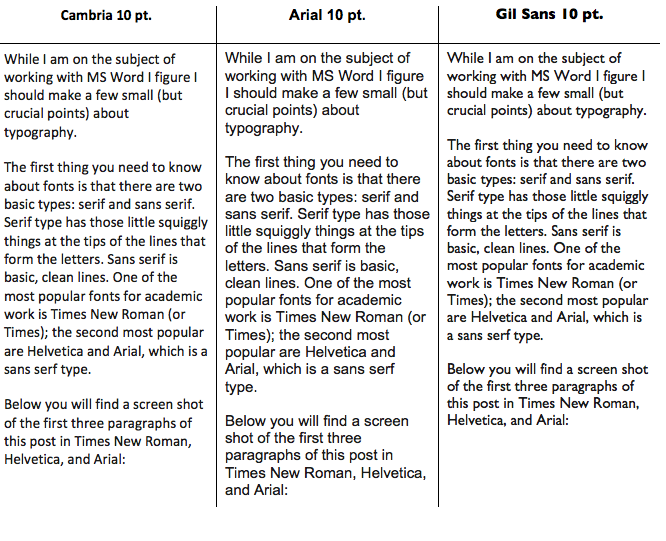 A pet peeve: MS Word is more than a typewriter! Learn it! Ok ok. I’m going to let off a bit of steam here. My biggest pet peeve is having to deal with a document written by someone who has never learned how to use even the most basic features of MS Word. Beginning with…would you believe…word wrap? I still get materials from writers who use a carriage return at the end of each line. Most, of course, do understand word wrap — that is, that the software will wrap the text to fit any line length you specify. So, for instance, if you have need for a 4″ text line, you just set your margins, and voila, Word wraps your line around that length and there you are. But beyond that most are clueless. Among other things, I will secretly hate you if you use tabs or spaces for indents, and tabs or spaces plus carriage returns to set up the format of your bibliography. I will hate you because in order to properly format all of the above, I will have to remove every tab, every space, and every carriage return that doesn’t follow the final period in a citation. I will secretly hate you because having to do all that repeatedly (remember most of you send me long documents, and I have many other clients doing the same thing) results in repetitive stress injuries and the need for physical therapy. Back in the dark ages, long before computers, I took a typing class as a freshman in high school with the expectation that it would serve me well throughout my education as I would be typing many papers. I was right. I learned to touch type and ultimately pushed up my speed to 65 wpm as I also began composing with the typewriter. Now with my compact Mac keyboard I am able to type almost as fast as I can think! I bring that up to make another point: somewhere along the way you all should have had a class in how to use the amazing functions of MS Word. I don’t care how “un-intellectual” or how “vocational” such a course might seem. Like the typing course I took in high school, it will serve you well throughout your education, and your life if you plan to be an academic. 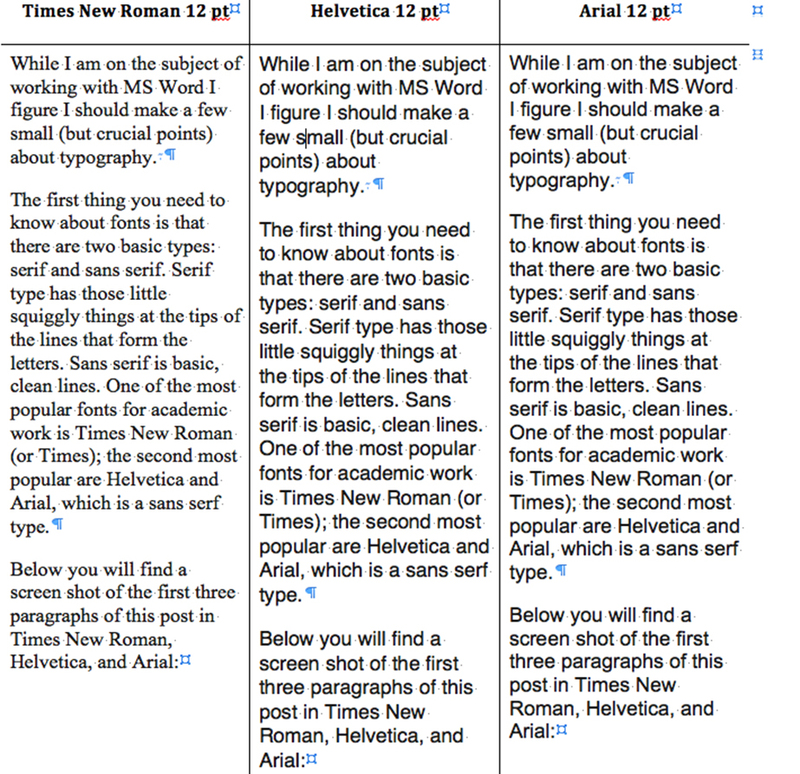 Word’s style format function is a dissertation editor/writer’s godsend. 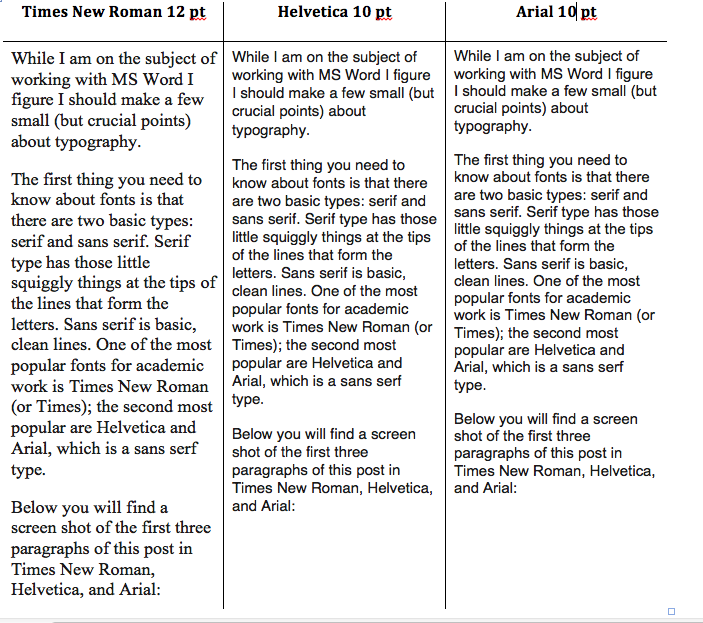 If you set styles for body text, headings, footnotes, and bibliographies, and use them religiously, you can be guaranteed that your final document will match up to your Graduate College’s requirements. And if there is a mistake it can take a minute or less to fix the problem. Even more wonderful is that Word can generate a Table of Contents, with all the pages perfectly matched to the headings, in the blink of an eye. Because I have learned the hard way that the vast majority (as in 99.9999%) of the people who will be submitting work to me will have little to no acquaintance with Word beyond Word wrap and maybe setting margins, and as a consequence I would be having to deal with massive amounts of formatting and the resulting RSI’s, I am going to charge a separate fee for formatting, to wit: an extra $1.50 per page. Now, believe me, this is not me being either mean or greedy. It is me trying to save my body. Because the point of it isn’t to bring in more money for me, it is to get you to do your own formatting. You may even find instructions and templates specific to your own university if you just add the name of your university to the search terms. Ain’t life wonderful with Google? You just have to know what search terms to use, and often that’s pretty basic, as above. 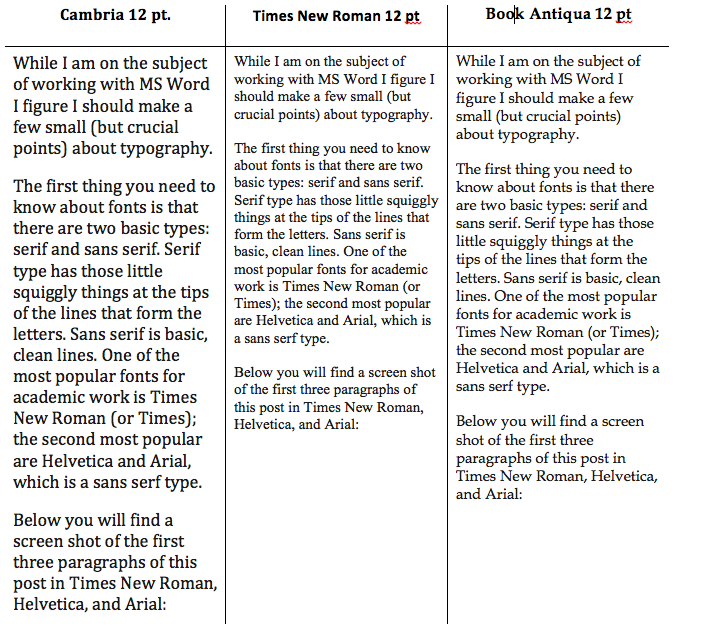 So, if you haven’t had a class in how to use Word, don’t have the time for one, but expect to be producing written documents for academia for some time, whether as student or faculty, it’s time to give yourself a self-driven course in using styles for formatting. You will thank yourself, and your editors (including journal editors) will thank you. This entry was posted in Details, Surviving Academia, Writing the Dissertation and tagged academic editing, dissertation, format, formatting, MS Word, writing on January 23, 2013 by matrixedit. One way to improve your writing — please banish the word “importance” and all its variations from your vocabulary. Every once in a while the word and its cohorts might have a place, but for the most part it is empty and it says absolutely nothing. Instead of CLAIMING value for a finding (or whatever else you are saying is important), DEMONSTRATE it. In addition, all three pedagogical projects are characterized by an articulated personal investment in the process. The importance of an articulated personal investment in the material was characteristic of all three pedagogical projects. We all used a variety of approaches to enunciating or deflecting attention away from elements of our identities as a part of the pedagogical project. This not only eliminated the word “important,” it also eliminated a lot of excess verbiage. Documenting these experiences, challenges, and our reflections on them, using detailed portraits, is a major contribution to the field. Documenting these experiences, challenges, and our reflections on them, using detailed portraits, revealed new insights into the body as text in the classroom. Notice how “revealed new insights” makes clear what the contribution is, DEMONSTRATING the contribution, rather than merely CLAIMING it. Language and self-identification regarding sexual orientation and gender expression emerged as an important theme among the cases. Similarly, I find sharing my experiences as a student to be very important, particularly for students of color. Similarly, I find sharing my experiences as a student to be very helpful to others, particularly for students of color. It is the “helpfulness” of the sharing that makes it important. Language and self-identification regarding sexual orientation and gender expression emerged repeatedly throughout the interviews. Language and self-identification regarding sexual orientation and gender expression emerged as a constant theme throughout the interviews. These latter two, though only slightly different from the original, still avoid the repetition of the word. Most important (grin), is that it reserves the word important to be used when it truly is important! This entry was posted in Details and tagged academic editing, diction (word choice), writing on January 20, 2013 by matrixedit.